"It's from scratch - and fast! With my easy formula, you can make a fresh soup du jour even on a busy weeknight." Bring broth and water to a simmer over medium-high heat in a large soup kettle. Meanwhile, separate chicken meat from skin and bones; reserve meat. Add skin and bones to the simmering broth. Reduce heat to low, partially cover and simmer until bones release their flavor, 20 to 30 minutes. This was just okay. Usually soup is even better the second day but no one seemed interested. Bummer. 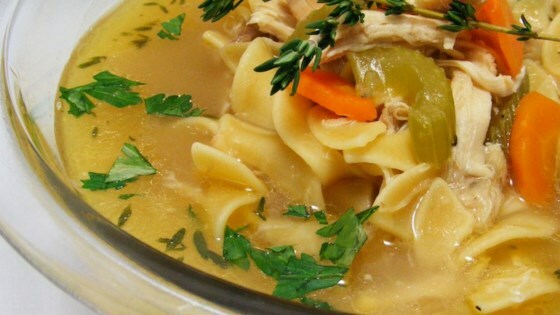 The quickest, easiest and best chicken soup base I ever made! This is a really great soup recipe. I made it exactly as written and it came out fabulous. I also used this as a base to make Chicken Tortellini Soup With Zucchini and Tomatoes. Fabulous! This is the first time I've ever made chicken soup "from scratch." I loved how easy it is and it is so good! A good fix for a quick dinner or for a sick family member.